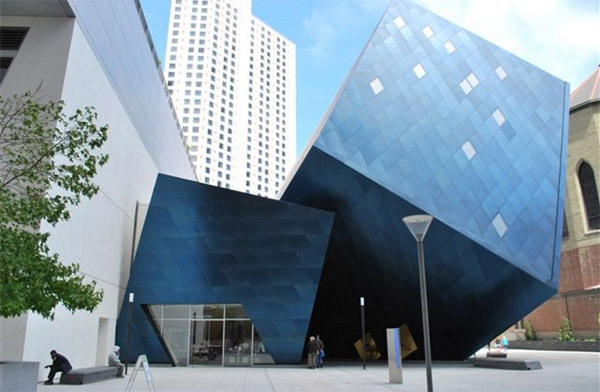 “Golem”; on the Contemporary Jewish Museum, San Francisco. I believe that architecture reflects game design better than any other discipline, so I’m taking an architecture criticism class taught by Pulitzer Prize-winning Paul Goldberger, the architecture critic at the New Yorker Vanity Fair. These are my essays, with a short post-mortem at the end. The “Architecture, Design, and Judaica” public tour at the Contemporary Jewish Museum in San Francisco starts with 15 more minutes of waiting as a volunteer guide named Donald recites a timeline at you with the same nagging rhythm normally reserved for dripping faucets. Then, finally, the tour moves to the lobby and begins in earnest. 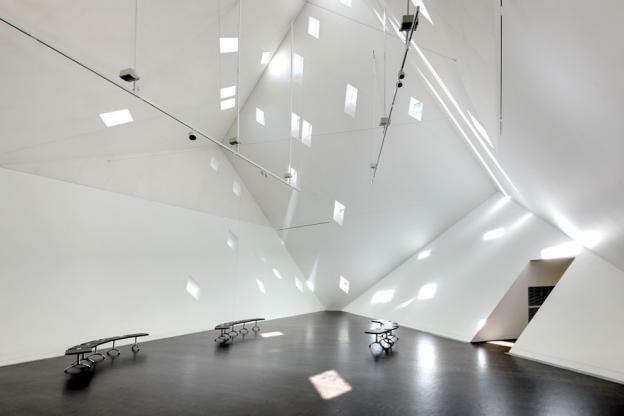 “The architect, Daniel Libeskind, builds around ideas,” begins Donald. But don’t all architects do that? Granted, not all these ideas are equally noble or ethical, but architecture, by it’s nature, always reflects some of the values of those who built it and use it. 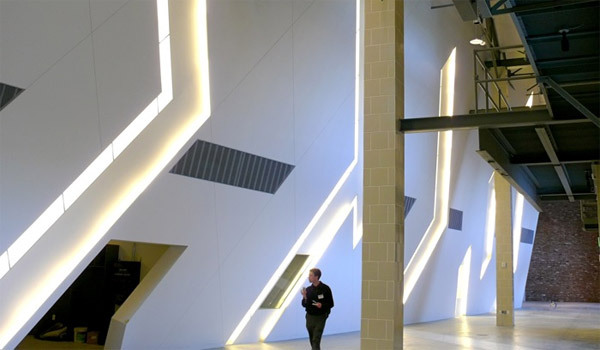 Judging from this building alone, it seems like Libeskind values spectacle above all else: the museum lobby is dominated by 50-foot tall glowing Hebrew characters emblazoned on the innermost wall, spelling out par’des (paradise). Yes, that is exactly what one might think. “But that’s why we have these architecture tours, and that’s why we installed that signage over there.” Donald points to a small plaque mounted on the opposite wall of the lobby, which means that you must face away from the exact wall-mounted light installation that the sign is trying to explain. In general, this museum seems to overestimate the power and value of signs, and how “helpful” they really are. “DO NOT ENTER” tells you to ignore the other entrance into the building, one of two pairs of plate glass doors framed by the restored City Beautiful era facade made of rich red brick and Beaux-Arts-style terra cotta ornaments. The graceful transition from the old 1881 power plant to the more modern remodeling is thoughtful; this paper sign, however, is thoughtless. The blocked left pair of doors are closer to the museum ticket desk, and the unlocked doors on the right lead to an overpriced, perpetually empty museum cafe and metal detector / security desk. Not only is the museum’s first welcoming gesture designed to frustrate your initial wayfinding, but it is also deeply suspicious of your intentions there. Perhaps the sign was referring to the entire building. “DO NOT SIT HERE” insists that the flat protruding base of a column in the lobby, is not for sitting. There is only one other set of benches in the narrow lobby, and there is no apparent reason why sitting on the block is forbidden other than to satisfy this building’s perpetual desire to be inconvenient. 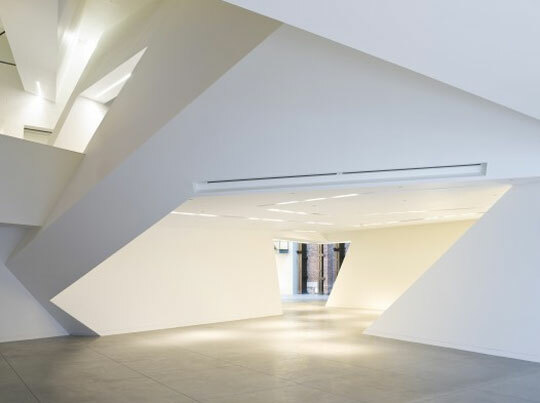 Libeskind, as channeled by Donald, would likely disagree with that word choice – the lack of 90 degree corners and orthogonal walls is meant to stimulate your mind and prevent complacency in understanding the building. This building wants to be noticed; it is the guy at the party wearing a cool hat, wishing you would ask him about his cool hat so he can talk about his cool hat. The Yud Gallery itself is empty and dead, devoid of chai. Very few people seem to visit the CJM in its capacities as a museum. It is supposedly a massive 63,000 square feet complex, larger than a regulation American football field, yet it only houses 4 small galleries, dwarfed by the gigantic and deserted gift shop that consumes an entire wing of the ground floor – and in 2 of the galleries, the walls are so slanted that the curators cannot hang any artwork upon them. Libeskind’s signs and labels, then, seem inconsistent with the actual experience of the architecture. Unlike “DO NOT ENTER” and “DO NOT SIT HERE,” his use of words to declare that a particular shape or form symbolizes life… does not necessarily make it symbolize life, assuming his signs get read at all. The large glowing par’des wall in the lobby has the subtlety and humility of a car insurance billboard, yet people so easily ignore it as an abstract light ornament as there is no accessible vantage point to view the entire fixture at once in such a narrow lobby – it suffers the fate of a billboard that no one notices, a symbol that doesn’t really exist. Or maybe par’des (which actually means “orchard”, Donald reminds me) symbolizes some deep emotional truth about how life is often unexpected, unknowable, and disappointing. That’s the thing with signs and symbols: they exist totally in the mind of the viewer. One, then, could argue that architects actually have very little control over how their buildings are understood or what their buildings mean: after all, a slow day transforms a life-affirming building into an empty coffin, just as a taped-up paper sign can transform carefully considered glass doors into an awkward window with handles. The tale of the golem is often used to illustrate the danger of hubris and arrogance, to think that power and truth can be so easily understood and manipulated, to believe that simply putting a word on something makes it yours with your meaning alone. 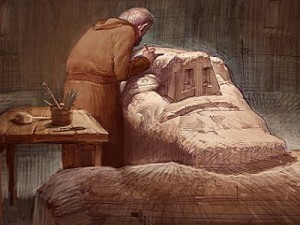 (Par’des, wrote Rabbi Libeskind on his golem.) But isn’t that what writers do all the time? Does that make Libeskind more a writer than an architect? At the end of the tour, I thanked Donald for his time. Perhaps Donald, willing to volunteer his time despite the fact that few people visit this museum and I am the only one on this tour – well, perhaps Donald gives life and purpose to the CJM. So I shook Donald’s hand. Then, having served his purpose, Donald promptly collapsed into dust. A-. The “Donald” device is effective. You never describe how the old building and the new metal forms intersect, you just gloss over it. Be careful of anthropomorphizing buildings too much. Also, as in your earlier piece, the ending is too cute. Let’s say the CJM was modeled and imported into a game environment. I think most critics would immediately compare it to Mirror’s Edge — which does not reflect the spirit of “reading the city” in parkour (it doesn’t teach you to read cities, it teaches you to look for red things) nor does it use the unique affordances of slanted surfaces present in so much of the architecture. The one moment it does use non-orthogonal angles in a special way, I suppose, is the one setpiece in the sewer when you’re sliding down a slope really really fast. What if we had to wall jump repeatedly in a triangular prism shaft? The level designers (Rob Briscoe et al) possibly found that playtesters couldn’t handle it or that the nav mesh couldn’t handle it, which is why most of the “real levels” are fairly orthogonal with 90 degree floor-to-wall joints everywhere. This suggests that slanted walls are “gimmicky” and serve a purely atmospheric / narrative function. Which would be okay, I think, if these environments weren’t intended to be read by players as uniquely spatial settings that afford movement in a special way different from other first person games. By the end of Mirror’s Edge, we’re trained to look at a wall and think about how to use it to get to the glowing red thing. When that wall serves no real purpose, or we read it and realize it makes no sense, then it’s disappointing. As for the business of symbolism / narrative, the less said about the game’s narrative the better. Even one of the prominent developers thought it was stupid: these “e-surance” style cartoon cutscenes that push a really loose, half-baked dystopian narrative. Hmm. Maybe CJM and Mirror’s Edge have more in common than I thought. 8-bit Dragon Quest Google Map!